No stamping, no embossing, no die cutting. How easy is that? After the holidays last year (Or was it the year before?? I have searched my receipt files, cannot find the receipt. ), I bought this Recollections Red & White Christmas (12 x 12) pad on clearance at my local Michael’s store. I love that it has metallics! I knew I could use it for many things. I am suddenly a little behind on Christmas things for home this year, I may be making all of my own gift tags out of this. 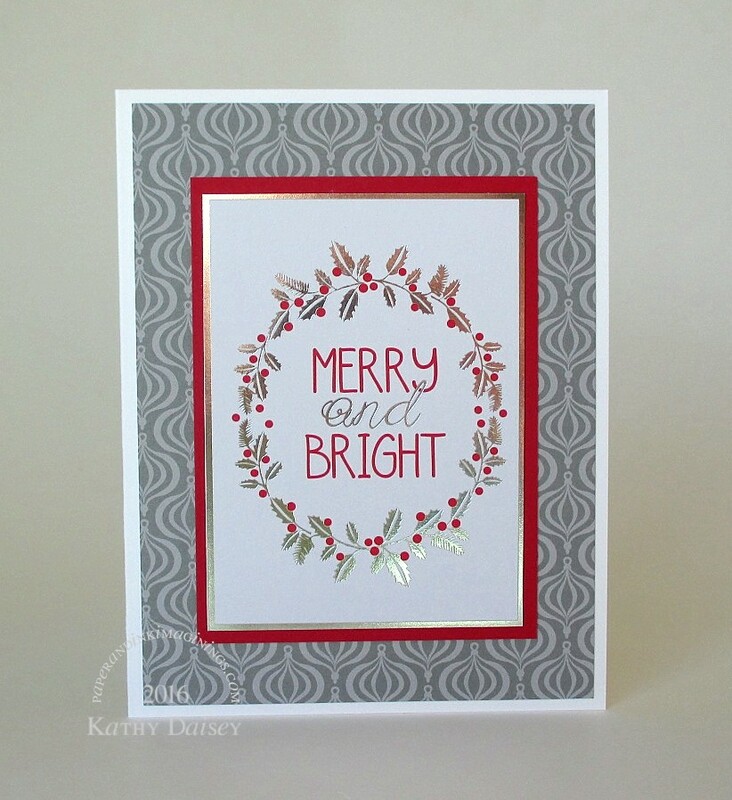 Supplies: paper – Neenah Classic Crest Solar White, Recollections Red & White Christmas, Taylored Expressions Cherry Pop. Categories: card, holiday | Tags: card, Neenah, Recollections, Taylored Expressions | Permalink. Really nice and a great way to get some cards done quickly. Thanks for the idea as I am running very behind this year. Very classy! I am also behind with my cards, although better than last year. Thank you! I have only just cut the paper for my cards (I make one design each year). Have not even thought about cards for my parents to send. Do you wait until after Thanksgiving before going into full on Christmas mode? No, I don’t have a rule about that! 😉 I have had my card designed for several months, just never started production. The last 6 or 7 weeks have been busy with family health issues. Several months! I think I need to hire you…. Don’t think I set out to design my holiday card that early! It was a card I used in a blog post, and it sat on my counter for a few days…and I thought, yeah, I like that enough to make 35. All stamping, no coloring. Truly beautiful Kathy. Well done! Very nice layout and I’m surprised, that it’s made of paper only! Beautiful card! Thank you, Regina! Really easy, beautiful foil. I love that it has metallics!